New Updates and Features are Heading Your Way! We’ve got lots of updates to share with you! 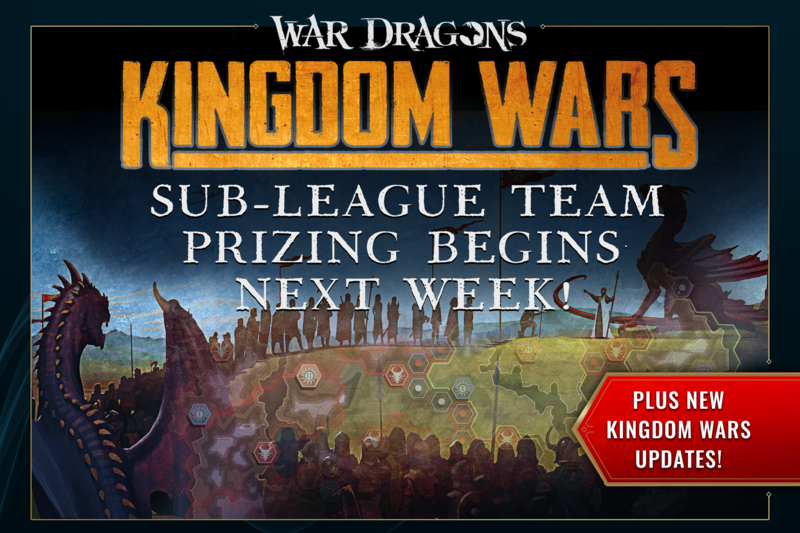 Next week brings a refreshed Kingdom Wars event and the highly requested feature, Sub-League Prizing! Read on for more information about both! What is Sub-League Team Prizing? Sub-League Team prizing is the differentiation of team prizes within any given league. For example, Diamond League prizing will now be divided into prizes for D1 and prizes for D2. Will Sub-League Team Prizing exist in all events, or just PVP events? This new prizing will only exist in PvP events for now. When will Sub-League Team Prizing be available? This will first be available during Kingdom Wars next week, the week of 7/25. The new PVP event, Kingdom Wars, is back in action next week! This time, new improvements have been added to the event based on player feedback and team development. Check ‘em out below! We’ve heard your feedback that it was previously too easy for teams to run away with the lead. We want to give weaker teams a chance to fight back and keep the event more competitive. Teams will receive a damage multiplier whenever they attack one of the leading enemy teams. The multiplier will be determined by the VP/hour discrepancy between the two teams. Example: If a team with 100 VP/hour is attacking a team with 200 VP/hour, they will get a 1.1 point multiplier meaning they get both more individual points and deal more damage. Issues with the map being displayed on certain iOS devices running iOS 8 had been an issue we’d been tracking through the last few runs of this event. Players using these devices will see improved performance. We’ve heard from players that it can be difficult to know which territory is currently under attack during the event, so we’ve made some modifications that will help make things more visible. Whenever a team has has over 50% damage inflicted to one of their kingdom borders, the outline (border) of that territory will start pulsating in a distinct color. This will urge them to fight back and hopefully boost engagement. Teams will be able to ‘train’ for combat by attacking their own capital. When attacking your own capital you’ll be able to select one of the Blackblood members to attack for limited points. This is specifically to address a case where a team gets surrounded by an enemy they cannot attack. Previously, those teams were effectively eliminated from the event, but now, they’ll be able to gain individual points during the event, not matter how many territories they’ve conquered! Kingdom Wars has done a great job upon launch to surface the issue of sandbagging within leagues. The way the map is visually laid out, it’s easy to tell which teams have completely dominated the map and crushed their opponents. This caused us to think about the issue of team strength distribution across leagues. Sub-League Team Prizing will help benefit teams that strive to reach higher leagues and battle against equally powerful opponents, encouraging genuine progression and fair play. Sub-League Team Prizing will first be available to those in Diamond 1 & 2 for now. What are your thoughts on the new Sub-League Team Prizing and Kingdom Wars event updates? Head over to the War Dragons Forums to get the conversation started!